Clicking on this photo will give you access to a 222K file. Third Row: Ken Wright, Ken Lambert, ? 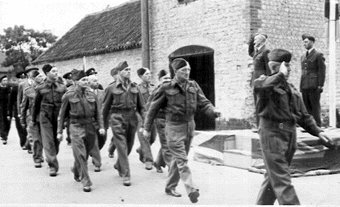 Hicks, Jack Garner, Maurice Pryer, Walter Brown, Mervyn Morley, Douglas Wing, Herbert Reeve, Geoffrey Pylon, Charles Fletcher, William Land, Raymond Wright, Charlie Wright. 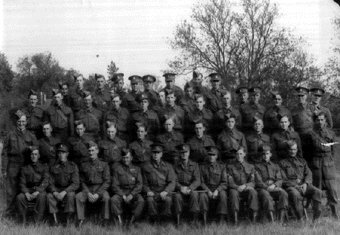 Front Row: Ernie Vine, Stan Walker, William Harvey, Aley Banham, Jack (John) Orange, Arthur Dennington, Jack Southgate, Frank Curtis, Warren Back, Henry Johnson. Civil Defence group at the rear. 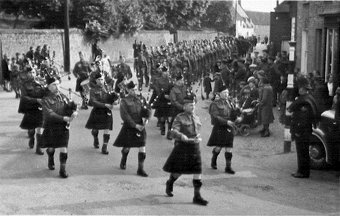 Home Guard behind the pipers. Note the direction signs had been removed. The policeman is acting Sergeant Buckle. The wall is around Feltwell Hall. Also note that there are no pavements.